The Using operator is a way you can instruct an Observable to create a resource that exists only during the lifespan of the Observable and is disposed of when the Observable terminates. 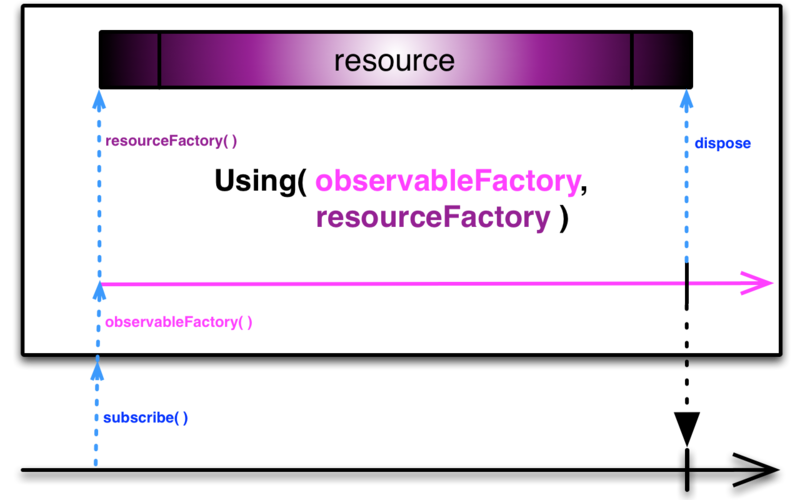 When an observer subscribes to the Observable returned from using, using will use the Observable factory function to create the Observable the observer will observe, while at the same time using the resource factory function to create whichever resource you have designed it to make. When the observer unsubscribes from the Observable, or when the Observable terminates (normally or with an error), using will call the third function to dispose of the resource it created. using does not by default operate on any particular Scheduler. When an observer subscribes to the Observable returned from using, using will use the Observable factory function to create the Observable the observer will observe, while at the same time using the resource factory function to create whichever resource you have designed it to make. To dispose of the resource, call the dispose method of the subscription that was returned from the subscribe call you used to subscribe an observer to the Observable that you modified with using.